This model has been discontinued. Visit top grills of 2019 for other options. The basic 3-burner Spirit grill from Weber runs around $600USD and offers little more than a cookout, but is it worth it. 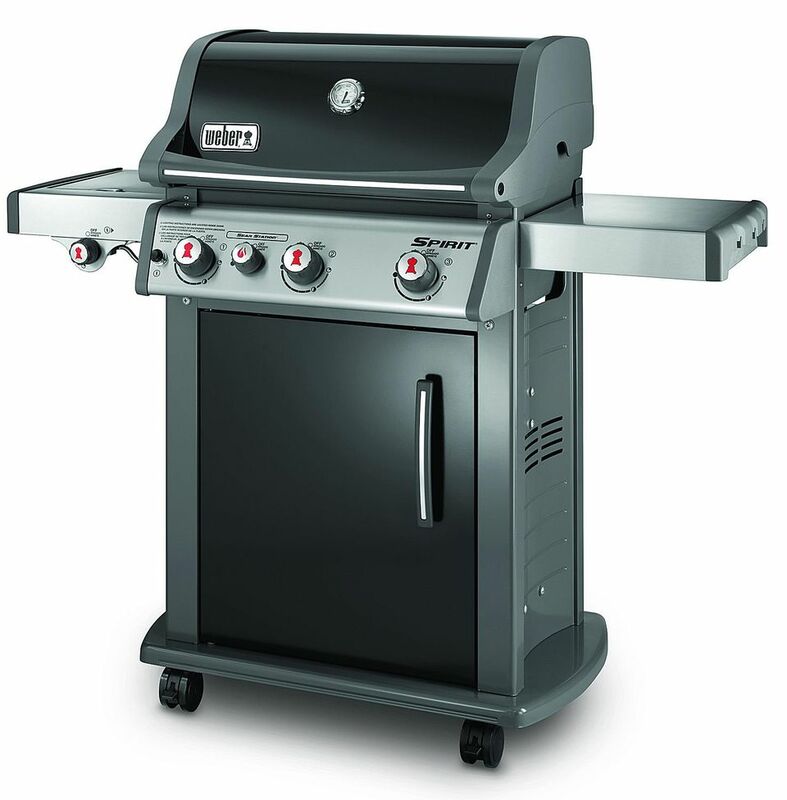 The Spirit line gas grills are made in China by Weber, use inferior stainless steel, and are very basic. So why is this better than the same sized and featured grill at most any store for half the price? Good question. We would argue that this grill is better built than those and that Weber's warranty and support are much better. The "sear burner" built into this particular model, gives this grill great heat output, if only on one side. For nearly 30 years, Weber has made some of the best and best-respected gas grills in their price range. Carving out the space between the hardware store bargain grills and the high-end appliance store units, Weber has been comfortable in its space. A few years ago, Weber reintroduced their Spirit line of grills to widen their market share. For 2013, the Spirit grills were redesigned to bring them into line with Weber's accessories and Genesis model grills. The Spirit E-330 is the most expensive of this line. With the space and the versatility of a three burner gas grill, this one isn't overloaded with unnecessary stainless steel parts like some of the models in the Spirit line and this version is loaded with all the accessories that Weber offers for its lowest-priced line of gas grills. The 12,000 BTU side is a nice feature for those that will use it. This 3-burner unit has enough cooking space to accommodate most families, the porcelain coated cast iron cooking grates that are heavy enough to create grill marks, and a basic set of Weber extras like a tank gauge to help you not run out of gas. The one feature that stands out in this particular version is the internal 7,500 BTU "sear" burner. This is not an infrared burner and has less power than the two standard burners that sit on either side of it. What this burner is advertised as doing is boosting the heat to give the kind of intense heat that is necessary to get that perfect steak. The reality is that this burner lifts the output to where it really should have been from the beginning. The Spirit line of gas grills, like the more expensive Genesis models, are a little limited in heat output. This sear burner means that half of this grill is excellent, powerful, and capable of doing some serious grilling. The other half is a good warming space. The big question about this gas grill is whether or not it is worth the price. At around $600USD, there are a number of grills that are cheaper. Like those grills, this one is made in China and uses lower grade stainless steel for its burners and other components. That being said, when we look through my database of grills, this one does, in fact, stand out as a good grill.